Sometimes Mother Nature has other ideas. Over time I have learned to work with and follow the call of whims of her temperament. I spent the last couple of days and nights in the St. Helens area and the sun was only visible through the fog and mist with some clearing for short interludes primarily during the middle of the day. But the fog and mist unlocked for me a least a much more interesting world than the now all too common classic view of the peak and flowers. 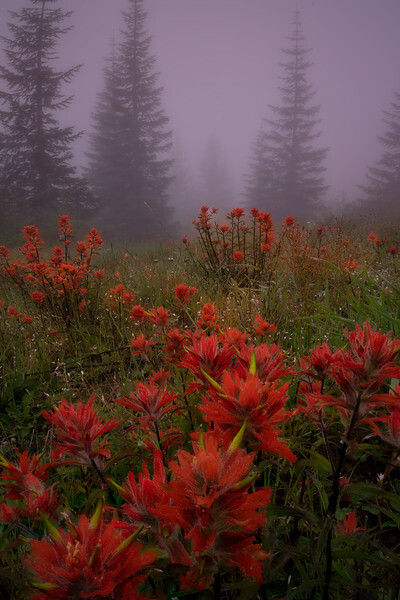 I just loved the many views of the flowers at their prime in the mist. On this quiet morning everything looked perfect and it could not have been better for me. Thanks Mother Nature for your gift.